If I imagined a whiff of hubris in McQuaid’s ambitions, the Pulitzer Prize-winning journalist certainly proved himself up to the task, distilling and presenting in lively and entertaining prose a dizzying amount of scientific and cultural research throughout. I’m not sure I would have ever made the connection between President George H.W. Bush’s famous dislike of broccoli and the survival instincts of a 500-million-year-old sea anemone, but McQuaid skillfully connects some very disparate dots. On one hand, McQuaid provides evidence that aversion to bitterness, whether experienced by a simple life form or a more evolved one such as the Bush family, is a way of testing and rejecting potential toxins. Nevertheless, a taste for bitterness grew as humans evolved, making it as essential to our palates as sweet, sour, and salt. Cauliflower, Brussels sprouts, radishes, cocoa, beer, and coffee all have appealing bitter qualities. Whether investigating our seemingly irrational attraction to insanely hot chiles, the history-changing effects of fermentation, or how the brain reacts to sweetness, McQuaid’s quest in this book is to debunk the prejudice held for centuries by the learned that of all the senses that of taste is the least consequential. 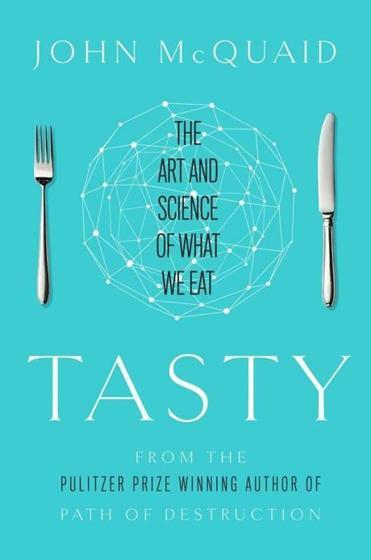 McQuaid’s presentation of the scientific research is fascinating, but what elevates “Tasty’’ is the author’s inclusion of history, culture, and art. Before launching into the scientific research into sweetness, he tells the 2,500-year-old story of the two Indian brothers who stopped their caravan to give a sweet treat to a beggar by the side of the road. The beggar was none other than Siddhartha Guatama, the Buddha. Because his spiritual evolution had freed him from desire (eliminating one side of Berridge’s triangular theory), the Buddha was able to devote himself to the simple enjoyment of his cake. My favorite chapter was “The DNA of Deliciousness,’’ and the author admits, “Deliciousness is a slippery concept. It is an ideal, something chefs aspire to create and everyone wants to experience.” He writes of the discovery in 1907 of umami and its recognition as a basic taste and how 90 years later a restaurant entrepreneur named Adam Fleishman was eating an In-n-Out burger in Los Angeles and obsessing over umami. Like a mad scientist he retreated to his home and spent countless hours mashing together strange ingredients until he came up with the perfect “umami burger’’ (to my mind one of the best burgers that’s ever met my mouth). For all the wonderful, eclectic information McQuaid brings together in “Tasty,’’ I’m sure he’d be the first to admit that some tastes remain elusive and mysterious and beyond the grasp of science. Fleishman’s Umami Burger is delicious because . . . well, it just is.